Airedale Springs Won the Business Growth Award! We Won the Business Growth Award! On our previous blog, we shared the exciting news that Airedale Springs had been nominated by the EFF for the Business Growth Award. Well, the results are in and we are extremely proud to announce that we won the Business Growth Award! 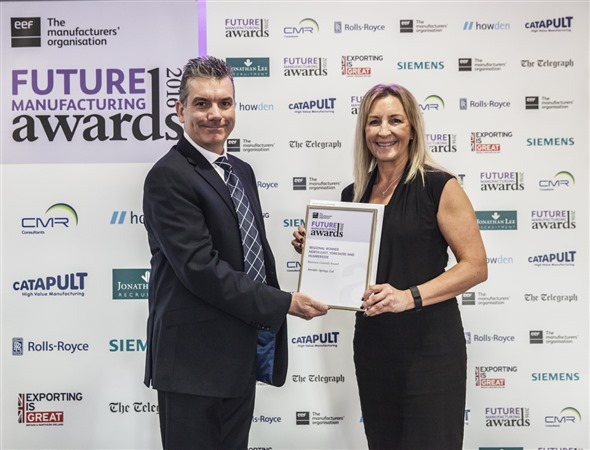 The award itself was the Business Growth Award for the North East, Yorkshire, and Humber region and Airedale Springs took gold at the EEF Future Manufacturing Awards. They were up against the likes of furniture manufacturers STEVRO Ltd, and window manufacturers Building Product Solutions, but on the big day, Airedale came up trumps. With this amazing achievement, we wanted to talk about the award itself and how proud we are of winning such a highly regarded award. What is the Business Growth Award? The award itself is an acknowledgement of a company delivering dynamic business growth in all departments, from the directors all the way to the manufacturing floor, through a consistent growth strategy. When it came to the awards ceremony, Airedale Springs were up against a range of competitive businesses from all across the local region. In order to be awarded, they had to be scrutinised by a panel of judges that consisted of business leaders, industry experts and even academics. The goal was to impress each of them with their own business plan that clearly stated what they had to do in order to grow their business within the current industrial climate and throughout the rest of the 21st century. Now that Airedale Springs have won this fantastic award, what is the next step? Well, in January 2017, Airedale Springs will carry on the awards train and head to an awards gala dinner in London to compete for the national title for the Business Growth Award. We are incredibly excited to be part of this whole endeavour, but we could not have done it without our excellent and extremely hard working team, so we extend a massive round of applause to everyone here at Airedale Springs! If you would like to know more about what it takes to be a winner of the Business Growth Award, then you are more than happy to contact us. Simply give us a call today on 01535 643456 and one of our incredibly friendly members of staff will be able to help.